The Friends of Wireless Hill Park is a community group, made up of volunteers, that is dedicated to conserving and protecting the bushland of Wireless Hill Park. The Friends group was established in 1987. The Friends group aims to rehabilitate the bushland and maintain its biodiversity. The Friends group works with others including the City of Melville and the Wildflower Society of Western Australia to enhance the Park for visitors, for example through the development of a sign-posted Wildflower Walk and through guided walks for the community, held in spring. We are fortunate to have Wireless Hill Park as a legacy of the Wireless Hill communications station. At the time that the communication station was built, the entire area was cleared, apart from a small patch of land near the current Council Office carpark. Veldt grass (from South Africa) was planted to stabilise the soil. 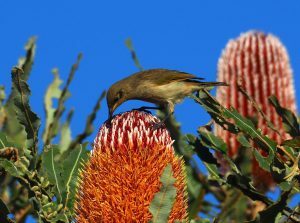 The bush has largely regenerated itself from seeds of native plants in the surrounding bush, which are now the suburbs of Booragoon, Ardross, Alfred Cove and Applecross. Gradually, the Veldt grass is being replaced by natural vegetation. The Wireless Hill bushland has been able to thrive among the suburbs, due to the area being reserved for the communication station and therefore not available for housing development.